“It’s All New!” Giveaway Day TWO! It’s DAY TWO of my “All New” Giveaway! As you may have seen, my blog has an “All New” look to celebrate my one year “blog-iversary”! The giveaway is running ALL five days this week–and you are welcome to enter any days that are interesting to you. Today is DAY TWO and focuses on twelve AMAZING grade 3 and 4 sellers. This is really a GREAT way to show support for the blogs and stores that you already follow AND to find some new bloggers to follow along the way! REMEMBER–You only have TWO days to enter each day’s giveaway so don’t wait! 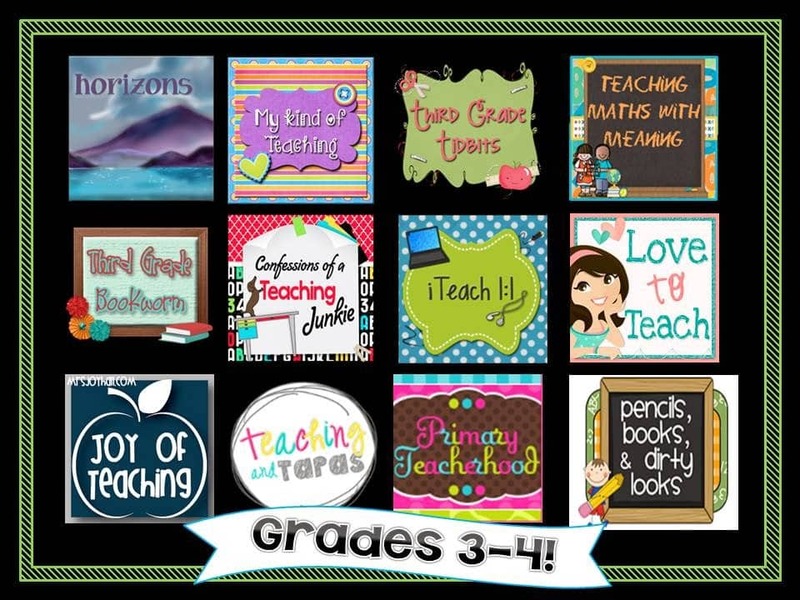 Check out the 12 featured grade 3/4 bloggers/Teachers Pay Teachers “creators” who have graciously donated $10 worth of products to their store. That means EACH DAY you have the chance to win $120 worth of products–that YOU get to choose! It’s a great prize if you ask me–to be able to look through the stores of all these creative people and PICK ten dollar’s worth of your favorite things. MANY of these great sellers have “new” products they would like you to see–so stop by as many blogs as you can to see what everyone as to offer. Remember the schedule for week! Are you ready to enter and win? Remember, you can enter as many days you want–and right now check out the TWO rafflecopters below–one to win the $120 “shopping spree” from the 12 great stores above AND a second one “just for fun”–leave me a blog comment and get a chance to win a $50 shopping spree in MY store! Thanks for stopping by today–and hope to see you tomorrow too! All winners will be announced on Sunday! You might have tuned in yesterday for my extra deal…I am going to offer one of my newer products each day at 50% off! Grab something new each day at an unbelievable price! Today’s special deal? 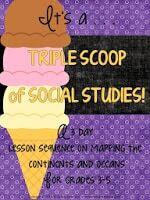 My “Triple Scoop” Mapping the Continents and Oceans resource. Regularly $3.50–but available today only for $1.75! Check it out–lots of photos to show how I used it–includes extension activities as well!